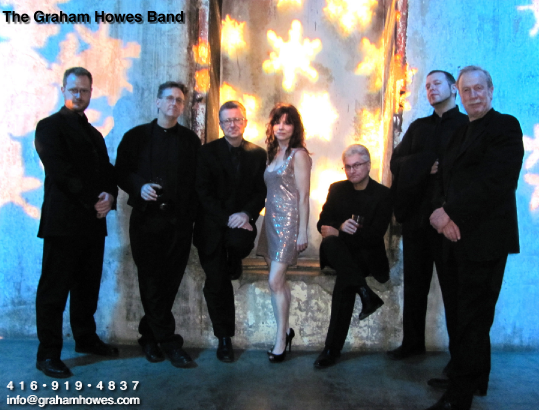 For over twenty years, the Graham Howes Band has been entertaining audiences at weddings, international corporate receptions, society balls and private parties. We are on the recommended Supplier Lists of two of the most exclusive venues in Toronto: Graydon Hall Manor and the Estates of Sunnybrook. Companies such as Rogers Communications, Mary Kay (Canada) and Scotia Bank have hired us to provide a wide range of services such as employee recognition, product launches and company celebrations. Each year we perform at numerous society fundraising galas: St. Michael’s Hospital Foundation, R.E.A.C.H, for the Rainbow Foundation, Mount Sinai Hospital Foundation. As professional musicians we perform often as a seven-piece band. We also have the skill to play in smaller and larger configurations from trio to nineteen-pieces! Whatever the size, we deliver strong vocals backed by Toronto’s most highly-skilled and proficient musicians. And people love to dance to us – we get the guests up on the dance floor and keep them there! Requests are not a problem – our song list is over 1600 songs and growing.